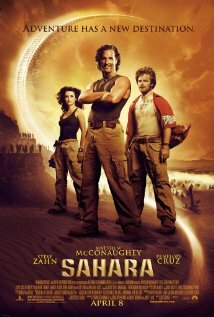 Matthew McConaughey and Steve Zahn are still in shock over the fact that “Sahara” lost money at the box office. You know how sometimes you’re at a party, and someone corners you and forces you to a listen to an annoying inconsequential story that you have no investment or interest in? Sahara is the movie version of that kind of thing. While it can’t be denied that this movie has its fair share of well-shot action scenes, it’s disconnected, boring at times, and features not very interesting people you’re supposed to like. For 124 minutes, we as the viewer are subjected to mostly pointless dialogue scenes, occasionally broken by the fascinating shootout, chase, or explosion. The movie starts with Eva Rojas (PENELOPE CRUZ), a doctor for the World Heath Organization, who is in Africa investigating a spreading disease. Don’t worry, if you don’t like this plot, it’s forgotten quickly, because when an attempt is made on her life, she’s saved by adventurer Dirk Pitt (MATTHEW MCCONAUGHEY). (Also, if you choose to watch this, you’ll notice that abandoning plotlines and plot points is a recurring event). 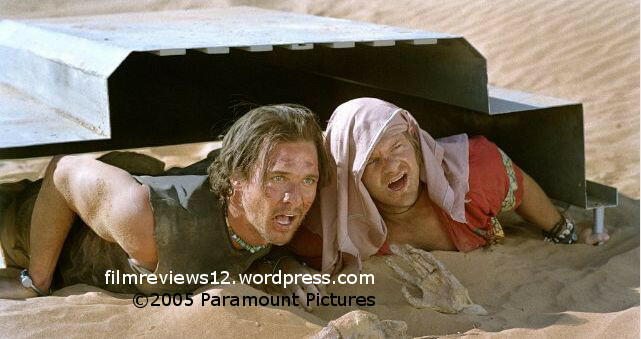 Dirk Pitt works for NUMA (National Underwater and Marine Agency), with his comic relief friend, Al. This is a comic relief friend, so he’s played by none other than Steve Zahn. Dirk is on a mission to find a Confederate coin that was lost on the ship known as the Texas at the end of the Civil War. He recruits Eva on the mission. The main thing missing from Sahara is joy. There’s a kind of fun that everyone wants from a popcorn blockbuster, and I’m sad to report that just can’t be found here. Another negative driving into this one is the absolutely senseless plot. I’m not talking about a fun senseless, like Independence Day (Emmerich, 1996), I’m talking about an unfinished senseless, like the screenplay, adapted from a 1992 novel, really hadn’t worked everything out itself. And while it has recognizable names, like Cruz, McConaughey, Zahn, and Rainn Wilson (also, the head of NUSA is played by William H. Macy), these parts could have been played by near anyone, as they don’t really call for much talent aside from yelling a few one-liners and reacting to surprise attacks. Visually, Sahara carries its best material. Everything contains a fair amount of detail and fascination. If this had been two hours of nonstop overhead shots, car chases, and stuff blowing up, this would have been a marginally more enjoyable experience, but Sahara really only has these things spread disappointingly apart. When it comes to movies, it hurts me the most when something has good potential, but it doesn’t pay off. I could have easily seen Sahara as an exciting adventure movie about the search for a century-old coin, but the truth is so far from this wish that I find it slightly distressing to think about. This movie is equal parts pitiful and disappointing. I’ve sometimes wondered if these two feelings go hand in hand.